Receiving Student Government Leadership Awards were Mitchell Furr of Sturgis, Jammie Minor and Stacy Minor of Union, Chris Monsivaes of Centreville, Iffe Oni a German International student living in Sturgis, and Leanna Tokarski of Three Rivers. Recognized with a Participation Award for Student Government were Trever Baldridge of Lagrange, Phallon Cook of White Pigeon, Kiri Johnson of Three Rivers, Kelsie Skeels of White Pigeon, Jessica Reed of Constantine and Michael Reynolds of Mendon. This was the first year for Science Club at Glen Oaks. A Science Club Leadership Award was presented to Jennifer Sprague of Sturgis. Recognized for a Participation Award in the Science Club were Maykol Hernandez of Centreville and Kevin Mullen of Sturgis. The Veteran’s Club announced two Participation Awards to Reginald J. Cezar of Centreville and Timothy Jordan of Colon. Ten students are featured in the latest edition of Who’s Who Among Students in American Junior Colleges. The students were nominated by faculty and editors based on their academic achievement, service to the community, leadership in extracurricular activities and potential for continued success. They join an elite group of students from institutions of higher learning in all 50 states, the District of Columbia and several foreign nations. The directory has been published since 1966 and continues to be a premier listing of outstanding campus leaders. Jena Bender of Shipshewana, Heather Bright of Centreville, Diane Brown of Sturgis, Si Feng of Three Rivers, Tabitha Hufnagle of Constantine, Charles Martin of LaGrange, Caryssa Matianski of Sturgis, Sara Miller of Sturgis, Carly Roach of Sturgis, and Miao Zhong of Sturgis. The Medical Assistant Club presented a dozen awards. Receiving the Leadership Award was Nora Marciniak of Three Rivers. 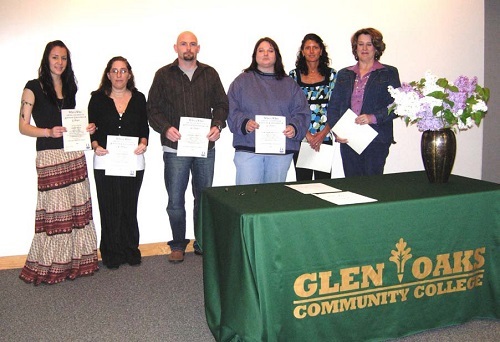 The Medical Assistant Club Participation Awards went to Kathleen Becze of Howe, Brandi Fisher of Constantine, Jessica Meister of Three Rivers, Pamela Moreno of Mongo, Leticia Rubio of Mendon, Cassandra Tuesley of Three Rivers, Shannon Tuttle of Vicksburg, and Jessica Wilder of Colon. The MA Club Exceptional Service Award was presented to Sara Miller of Sturgis, Iffe Oni of Sturgis and Leanna Tokarski of Three Rivers. Receiving the Exceptional Service Award, which involved serving in many volunteer activities throughout the year, were Sara Miller, Iffe Oni and Leanna Tokarski.